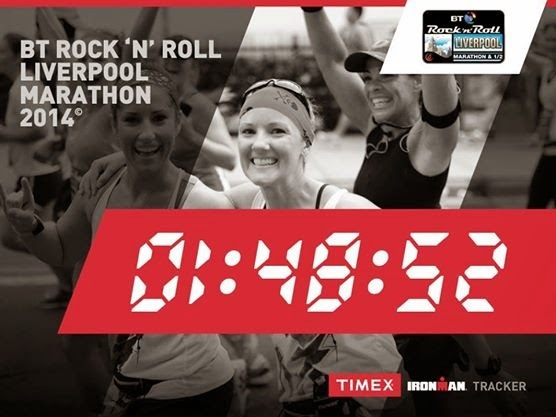 On Sunday 25th May 2014 I took part in the inaugural Liverpool Rock 'n' Roll Half Marathon. This was my 11th half marathon and my 8th race I have run for my very inspirational running buddy Haddie from the I run 4 group. 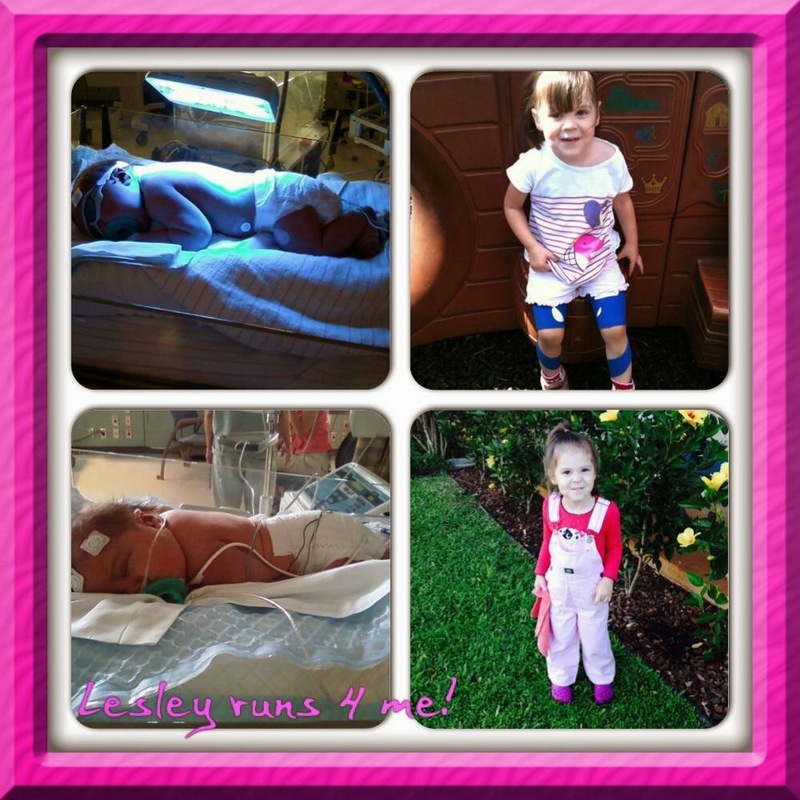 I have been buddies with Haddie since December 2013 and hearing how much effort she puts into daily life to gain strength and control of her body has given me the extra strength I need to believe in myself when the going gets tough! I give myself a good talking to and say if Haddie can ... I can! When I booked this race several months ago the start time had been advertised as "TBC" so when I received my runners pack last week I was dismayed to see a 8am start time for the Half Marathon and 9am for the Full Marathon! I have never known a Half Marathon start so early which is a bit of a problem when you aren't local. I looked for accommodation for staying the night before but by this late stage all the cheaper hotels were already fully booked so it looked like an early alarm call for me! After a fretful night's sleep my alarm woke me up at the unearthly hour of 5am. My original choice of outfit! My change of mind outfit! After having my usual pre-race porridge I got dressed in my running gear. I had already planned my outfit and attached my race number to a T Shirt the previous evening but when I opened my curtains on race day morning the sun was already making an attempt to shine, so I quickly checked the weather forecast for Liverpool! The forecast was for sun so I hastily changed into a running vest and reattached my number! I was feeling very cool, calm and collected when we left our home town of Kendal at around 5.45am for the 80 mile journey to Liverpool, which is very unusual for me on race day! Just as we were approaching Preston the weather changed and the sky went incredibly dark, a few miles further on we went through torrential rain! The driving conditions were hazardous as there was so much lying water on the motorway! We saw a car on the opposite carriageway aquaplane and spin out of control hitting the central barrier - thankfully the barrier did it's job or we would have been in it's direct line! This made us more cautious and we slowed down to be safe! I was beginning to fret about what sort of running conditions I was going to experience. As the forecast had been so good I was ill prepared with just a running vest and three-quarter trousers! I had no running jacket with me or anything waterproof to wear pre-race! Thankfully as we approached Liverpool we left the black skies behind and were greeted with blue! The start line when we first arrived @ 7:34am! The traffic was very light on our approach to the car park and we got parked easily. On the walk from the car park I ate my banana to make sure I was fully fueled up and ready to run! By the time we walked to the race village where the start line was it was just after 7.30 am. Although it was dry it was very chilly so I had several layers on to try and keep warm. I decided I needed a nervous wee so headed to the nearby portoloos. I was appalled to see there were very few loo's and I was ever so slightly rattled by the length of the queue and the diminishing time! There was no way I was going to get the the front of the queue in the 20 minutes I had before the race started. I decided to have a quick gander around to see if there were anymore loo's hiding and was delighted to see a sign saying there were toilets in the Echo Arena. I had a quick dash inside and thankfully there were loads of toilets and no queue! I rushed back to the starting line, and made my way to my starting coral. I was in coral 2 which was near the front, and furthest away from where we were! I just made it to my area, got my layers off, said goodbye to my husband and the countdown started for coral one to go! PHEW! It was a little close for comfort but at least I had no time to get nervous! Austin Healey, former rugby player started the race (apparantly he also held the finish line tape for the winners and greeted runners into the finish!). and this time I was off! I had decided to run with my virtual pacer on my Garmin and had set him to run at a 8:46 minute mile pace which would give me a PB finish at around 1:55. This is the first time I have tried this strategy! The race started at the Albert Dock on Liverpool’s Waterfront which was lined with cheering spectators and music before heading off towards the World Famous home of The Beatles – The Cavern Club. Despite there being approximately 3500 half marathoners this early part of the course wasn't over crowded at all and there was none of the usual pushing and hustling for space that sometimes happens in these larger events. I think having a staggered start with small numbers in each coral and then each coral starting a minute apart stopped this happening! The first band performed just beyond the start line on a pontoon boat in Salthouse Dock and the next was near The cavern Club. We then passed the Liver Buildings before heading towards Chinatown and running through the Chinese Arch. There was plenty of spectator support during this part of the course! The red guitar square indicates where the live bands played! The blue numbers are KM markers! I kept glancing at my Garmin on the way round to check I was still ahead of my pacer but I had no idea of the actual pace I was running! I managed to resist flicking to the screen that would tell me my minute mile pace etc as this usually "floors" me mentally as I start to panic when I think I am running too fast or too slow! I took my first gel at around the 3 mile mark when I could wash it down with a bottle of water! Thankfully the water was BOTTLED - not cups or those awful pouches! 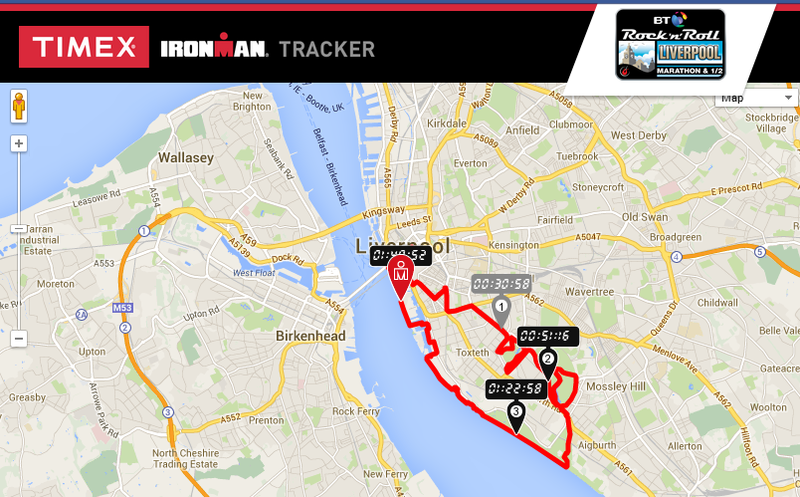 The route then took us through Princes Park, the beautiful Sefton Park and Otterspool Park. The heavy rain that we had experienced on our journey down must have fallen over Liverpool during the night as there were areas in these parks that were extremely wet and muddy! However, despite this hazard the parks were beautiful to run through with the sun shining through the trees highlighting the flowers and bushes! There was plenty of bands playing at regular intervals going through the parks along with plenty of spectator support. At around the 6 mile mark whilst going through one of the parks it was time for another gel to keep me fueled and rocking and rolling! After leaving the parks behind we headed towards and then along the promenade where at around 9 miles I took my final gel. At around 11 miles we hit the first and only part of the course that I didn't enjoy! We seemed to hit the back streets and there was no spectators to encourage us at all! 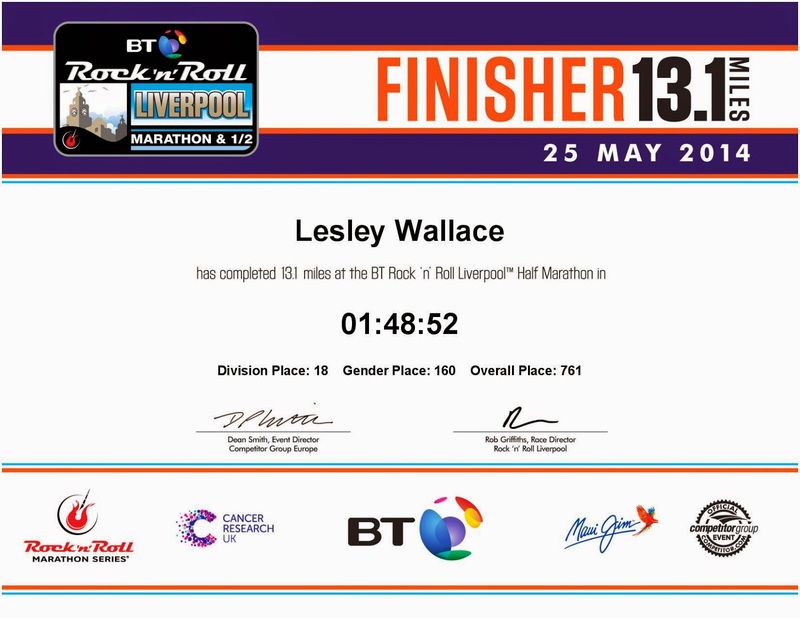 However, I was soon running towards to the finish line on the Waterfront alongside the Liverpool Echo Arena close to the start. The final mile was lined with spectators. A quick glance at my pacer confirmed I was ahead of my PB time. I tried to pick up the speed as I headed to the finish. I could see the clock counting upwards on 1:50:45 and realised that with the staggered start if I really pushed hard I might get a sub 1:50! Running down the home straight with determination! The cheers lifted my spirits and I soared through the finish feeling on a total high as I stopped my watch and saw the time of 1:48! Over the finish line and checking my watch for my time! I felt overwhelmed and close to tears that I had achieved a time that I had thought was unachievable for me! I waited with bated breath for my official time to be recorded on my FB page! A few very long minutes passed before it was confirmed that I had infact run a 1:48:52 Half Marathon slicing 7 minutes off my previous PB! On crossing the finish line I was immediately presented with a very large and heavy medal along with a bottle of water! Just as I was heading off to collect my goody bag from inside the Echo Arena I bumped into a friend from the "Run for Fun" facebook site! She had also run a fantastic race finishing in a super fast 1:34:41 also getting a PB! We waited a while to see if any more RFF-ers came through before going into the Arena to collect our goody bag and T shirt! Along with the technical T Shirt (I got an XS size which is still big!) we got a Lucazade drink, crisps, Haribo's and a Banana but the best bit was a voucher for a FREE beer! Not an Olympic athletes idea of an ideal post race goody bag but it hit the spot for this run for funner!! Free beer - would be rude not to! CHEERS! Once I had my beer in hand I was reunited with my husband! He commented that I was drinking beer at 10.30 in the morning! To be honest with being up since 5am I had no thoughts that it was still so early! I had run hard and deserved it! Waiting for the first marathoners to finish! We sat down for a while to enjoy the sun and the live music being played on the main stage and to partake in one of my favourite hobbies - people watching! After a while we headed back to the finish line to see the stragglers of the half marathon finishing and then the first few fast marathoners! All in all I had a fantastic day in a wonderful race and got a "only in my dreams" PB! I enjoyed the race so much I have already signed up for the 2015 Half Marathon! There was 235 runners in my division, 1855 females and 3485 runners in total, so feeling rather delighted with my efforts! I had run at an average 8:20 minute mile pace instead of the planned 8:47, but had no idea whilst I was running what my pace was! I am pleased I just ran to "beat" my virtual pacer and didn't stress about the ACTUAL pace I was running! No mental running wars going on in my head! I definitely try this strategy again and hope it works just as successfully next time! 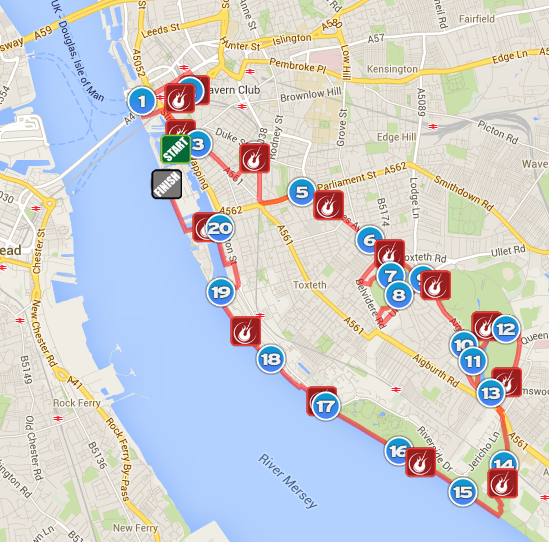 You can view my run here on Garmin! The target times I set myself and my actual race times. I don't know why 6K didn't register!